Rich, buttery shortbread. Tiny jammy windowpanes. Crispy twinkling sugar cookies. And must-have spicy gingerbread men. Bubbly Pink Moscato does wonders with jammy window pane biscuits celebrating fruity flavours. Moscato and sugar cookies are the best mischievous pairing for an afternoon of fun. Let's not forget the infamous gingerbread men and their spicy taste teaming up with our sweetest White Zinfandel. Finaly a bit of plain classic sophistication with our Chardonnay and shortbread biscuits. 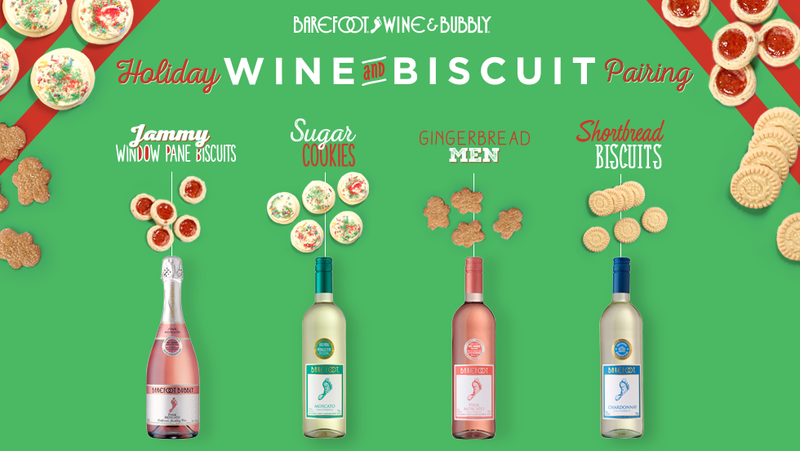 Up-level the fun and festiveness of holiday biscuit exchanges with a wine and biscuit pairing. Some biscuits make it to gift-giving tins; most get devoured on the spot. Either way, Barefoot’s got a wine or bubbly that highlights every bite.